NOTE: There have been many more updates to TCGP than are listed here. With time, some of the important changes may be documented here. TCGP's numerous back-end data handling and plotting scripts have been upgraded to use the latest version of NCAR Command Language (NCL v6.4.0). This change will provide TCGP will the full capabilities of the latest version of NCL. During the upgrade process, a few data issues occurred, such as the CHIPS ensemble not making it into the a-decks. For a 24-hour period, the b-decks for the Western Pacific basin were incorrectly truncated to one line, and the a-decks for this basin did not have the CARQ lines inserted. All of these issues have now been fixed. Additionally, two other enhancements were made to TCGP's back-end scripts. In the other global basins (e.g., Western Pacific, North Indian, Southern Hemisphere), the ATCF "cyclone type" field is typically not present. TCGP's routine that generates "nice" strings would normally put "CYCLONE TYPE UNKNOWN" in front of the storm name. This behavior has been changed so now nothing extra will be inserted before the storm name. Also, this code has been updated to fix another issue. 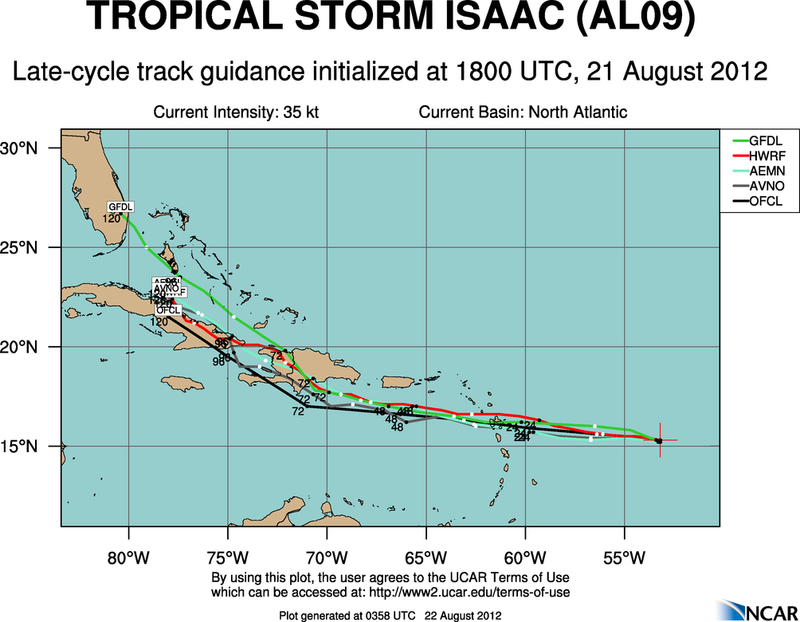 Because the ATCF field for stormname is truncated at 9 characters, when the stormname is a number (as is the case for tropical depressions), the truncated storm name (e.g., "TWENTY-TH") appeared in all of TCGP's links, page titles, and plots. Now, TCGP will use the full spelled-out number (e.g., "TWENTY-THREE"). The TCGP plotting system has been updated to use a newer, higher resolution map database. For those who like details, maps now use the "Earth..4" map database in NCAR Command Language (NCL). The previous map database ("Earth..1") did not include the island of Barbados, as well as some of the U.S. and British Virgin Islands, the Cayman Islands, and many other small islands. The new map database will also allow the state boundaries of Mexico, Brazil, Canada, and several other countries to be included. The outlines of U.S. counties will now be displayed whenever the range of the map domain is smaller than 30 degrees. Example of a plot using the old map database. The coastline is coarse and several significant islands, such as Barbados and Grand Cayman, do not appear. Example of a plot using the new map database. The coastline has much more detail and the map now displays the islands of Barbados, more of the British and U.S. Virgin Islands, the Cayman Islands, and many other smaller islands. The TCGP moves to a new server today. We expect the transition to be seamless to the users if they are using the http://www.ral.ucar.edu/hurricanes/ entry point. If you were previously using http://verif.rap.ucar.edu/guidance/ then please update your links. If you are still having trouble, please let us know. Phase I of the Tropical Cyclone Guidance Project (TCGP) was released today. In this initial release, the repository includes all available track and intensity forecasts in the National Hurricane Center's public ATCF a-decks as well as the developmental tracker results from the UK Met Office global model. This release also features four types of real-time guidance plots for the North Atlantic, Northeast Pacific, and Central Pacific basins. Phase I also implements a global overview map of current tropical cyclone activity with links to individual storm pages. Various text data files are also linked from each storm's individual storm pages. To find out more about our plans for future phases of this site's development, click here.